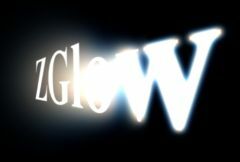 Glows areas of the source clip with varying widths depending on the depth values from a ZBuffer input. Separates the input into a number of layers and applies different amounts of glow depending on Width Near, Width Far, Brightness Near, and Brightness Far parameters. Background: Optional. The clip to combine the zs with. If no background is given, the Source is also used as the Background. Scales the color of the glow. The colors and brightnesses of the glow are also affected by the Source input. Width Near: Default: 0.05, Range: 0 or greater. The glow width of near (close) objects. Width Far: Default: 0.5, Range: 0 or greater. The glow width of far away objects. This can be used to raise the threshold on a specific color and thereby reduce the glow generated on areas of the source clip containing that color. Z Min: Default: 0, Range: 0 to 1. Clamps all Z values to this minimum bound. Use this parameter to create a constant glow on all parts of the image nearer than Z Min. Z Max: Default: 1, Range: 0 to 1. Clamps all Z values to this maximum bound. Use this parameter to create a constant glow on all parts of the image farther than Z Max. Color Near: Default rgb: [1 1 1]. Scales the glow color for near objects. Brightness Near: Default: 1, Range: 0 or greater. Scales the glow brightness for near objects. Width Red Near: Default: 1, Range: 0 or greater. Scales the red glow width for near objects. Width Green Near: Default: 1, Range: 0 or greater. Scales the green glow width for near objects. Width Blue Near: Default: 1, Range: 0 or greater. Scales the blue glow width for near objects. Color Far: Default rgb: [1 1 1]. Scales the glow color for far objects. Brightness Far: Default: 1, Range: 0 or greater. Scales the glow brightness for far objects. Width Red Far: Default: 1, Range: 0 or greater. Scales the red glow width for far objects. Width Green Far: Default: 1, Range: 0 or greater. Scales the green glow width for far objects. Width Blue Far: Default: 1, Range: 0 or greater. Scales the blue glow width for far objects. If this value is positive the output Alpha channel will include some opacity from the zs. The maximum of the red, green, and blue z brightness is scaled by this value and combined with the background Alpha at each pixel. Scales the opacity of the Source input when combined with the zs. This does not affect the generation of the zs themselves.